PTMC is a powerful trading platform that allows trading on all major financial markets, such as Stocks, Futures, Options, Forex/CFDs. Thanks to the wide range of charting and analytical functionality PTMC can meet the specific needs of even the most demanding traders. Started in 2015 as a standalone project of PFSOFT company, a well-known developer of financial technologies for brokerage business, PTMC gained a high interest from traders all over the world. Today PTMC community counts more than 10 000 of different market participants: from traders to developers. 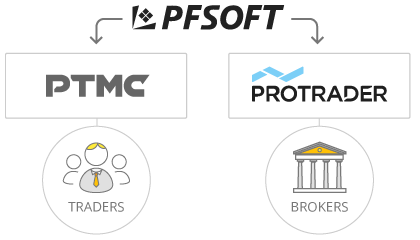 We feel the high synergy between Protrader and PTMC projects in close collaboration on trading functionality development when PTMC communicates with end-users and Protrader serves the Brokerage organizations. As a part of PFSOFT company, we have an ability to use the strong resource of Protrader Brokerage project but we are not going this way. With the foundation of PTMC project, we got a brand-new possibility to explore the market demands from the ground floor by communicating with the core participants of the trading sphere - professional traders. The PTMC's philosophy is "Platform, powered by traders" meaning that we strive to develop and improve the platform's functionality based on our users' demands. Each new day we feel the higher support and interest from our community that makes us believe that we are moving in the right direction. Taking into account the high feedback from PTMC traders we required to have a strong team of professionals to deal with the correct and fast development of demanded functionality. Currently, we have 20+ team players, dedicated to PTMC project. There are Analytics, Designers, Front-end (.NET) Developers, Quality assurance specialists as well as Support and Marketing teams. All these people are working each day on the common mission - make PTMC the most functional, convenient and stable platform on the financial market. Our ambitions are high and we feeling ready to overcome any troubles on making the best trading platform on market. We are confident that the more PTMC admirers we have - the more good things we can do together. So doors to our Team are always opened, no matter you are beginner trader, market analyst, enthusiastic programmer or professional trader. Just start from the less - register in PTMC community and contribute. And be sure - you will be rewarded respectively.